This is a most interesting document, as it not only shows the idealistic grounds on which the first English settlement of the Bahamas was established but also represents one of the most and liberal interpretations of religious tolerance of the time. The 1647 expedition to Eleuthera was set in motion by political conditions on Bermuda, where an Independent (Congregational or Separatist) congregation had been persecuted by the dominant Church of England faction since its establishment in 1643. Governor Sayle secured, with help from the Earl of Warwick (who had given the Separatists at Plymouth a charter in 1629), an Act of Parliament promising religious liberty in Bermuda but it did no good. He was then able to get permission to establish a new Independent (in both senses of the word) "plantation" or colony in the Bahamas. An expedition was sent in 1644 to explore these new islands, which had the unfortunate results of the loss of one vessel and the other failed to find a suitable island. Still, the Independents had to go somewhere, and Sayle, who was a ship's captain, took some seventy people on a small 50-ton ship and a shallop to establish "Eleutheria." The Bahamas colony was not a success. The same individualism that had arisen at the first settlement of Bermuda and later occasioned the Mayflower Compact in Plymouth Colony, split up the party. A Capt. Butler made so many problems that Sayle and the majority were obliged to find a separate island to settle on. It was then that their ship ran aground and although there was only one death, the group lost all of its provisons. Sayle took eight men in the shallop and went to Virginia for help, where he got a ship and supplies and returned to relieve the others. Some gave up and made their way backto Bermuda or other places, but others stayed in the Bahamas. More colonists arrived inr Eleuthera in 1649, and managed to get in a similar predicament of inadequate supply. This time it was the sympathetic Puritans of New England who came to the rescue, collecting £800 for supplies sent to the Bahamian colony. The Eleutherians didn'tr forgot this generosity and the following year sent to Harvard College £124 worth of valuable dyewood. There was yet another historical link between New England and Eleuthera. William Latham, who had come over on the Mayflower in 1620, left his farm in Duxbury and joined with the other Independents on Bermuda on their voyage to the Bahamas. 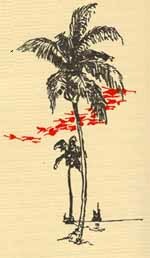 He was one of those who died there, a lonely Pilgrim on the shores of the palm and sea grape. Articles and Orders, made and agreed upon the 9th Day of July, 1647, and in the three and twentieth Year of the Raign of our Soveraign Lord Charles, by the Grace of God, King of England, Scotland, France, and Ireland; Defender of the Faith, &c. By the Company of ADVENTURERS for the PLANTATION of the islands of ELEUTHEIRA, formerly called BUHAMA, in AMERICA, and the adjacent Islands to be observed and performed by all and singular ADVENTURERS, to PLANTERS and dwellers upon and all Resiants at the same ISLANDS. WHEREAS experience hath shewed us the great inconveniences that have happened, both in this Kingdom of England and other places, by a rigid imposing upon all an uniformity and conformity in matters of judgment and practice in the things of Religion, whereby divisions have been made, factions fomented, persecutions induced, and the publick peace endangered. And for that we well know, that in this state of darkness and imperfection, we know but in part, That there are both babes and strongmen in Christ : And that every Member who holds the head, and is of the body of Jesus Christ, hath not the same place and office, nor the same measure of light, who yet desire and endeavour daily to increase in knowledge. And the mean time walk according to what they have received in all godliness, justice and sobriety. And whereas experience hath also showed us, That the peace and happy progress of all Plantations doth much depend upon the good government thereof, the equal distribution of justice, and respect to all persons, without faction or distinction the certain knowledge and manifestations of every ones rights and properties, and carefull provisions for common defence and safety. It is therefore ordered, That all such person and persons , who are so as aforesaid qualified, shall be received and accepted as Members of the said Company of Adventurers, and into the said Plantation, notwithstanding any other differences of judgement, under whatsoever names conveyed, walking with justice and sobriety, in their particular conversations and living peaceably and quietly as Members of the Republick. That there shall be no names of distinction or reproach, as Independent, Antinomian, Anabaptist, or any other cast upon any such for their difference in judgement, neither yet shall any person or persons assume or acknowledge any such distinguishing names, under the penalty of being accompted (in both such cases either of imposing or accepting or assuming any such name or names) as enemies of the publick peace : nor shall any man speak reproachfully of any person for his opinion, or of the opinion it self, otherwise then in the Scripture Language. That no Magistracie or Officers of the Republicke, nor any power derived from any of them, shall take notice of any man for his difference in judgement in matter of Religion, or have cognizance of any cause whatsoever of that nature : But that their jurisdiction shall reach onely to men as men, and shall take care that justice, peace, and sobriety, may be maintained among them. And that the flourishing state of the re-publick may be by all just means promoted. That the present Adventurers, and all other persons, who within the space of one year now next ensuing, shall bring into the publick stock, the sum of £ 100 shall be admitted and reckoned into the number of the first Adventurers, their number not exceeding one hundred persons. That every one of the number of the first Adventurers, shall have three hundred Acres of land, laid out for him and his Heirs for ever, in the first convenient place which shall be chosen, by those persons of the number of Adventurers, who shall go to the said Plantation, in the present expedition and shipping. And that the said quantity of three hundred Acres for each first Adventurer; shall at the end of the first three yeares, or sooner, if the major part of the said number or Company of first Adventurers shall require the same, shall be divided and set out by lot, unto every particular person. And that in the mean time, all the same Land shall be imployed and improved for the joynt advantage of the said Company. And that for the further and better encouragement of the said first Adventurers, every one of the said Company of first Adventurers shall have two thousand Acres more of land, to be laid out for him and his Heires for ever, in such place or places as shall be most convenient and satisfactory unto him, and least prejudicial or disadvantageous to the publick. And that this shall be effected with as much convenient speed, as the occasions of the Plantation will permit. And that all the adjacent Islands shall be reserved to, or laid out and had for the use of the said Company of first Adventurers. That as well every one of the Adventurers aforesaid, as also every other person, who shall at any time or times, within three yeares transport, at his own charge, unto the said Plantation, any person or persons, shall have and enjoy to him the said Transporter and his Heires for ever, the quantity of thirty five Acres of Land per person, for every person which he shall also transport; the same Land to be set out and appointed for him, by such as shall be hereafter authorized for that purpose by the first Adventurers upon the place. And that if any Servants or Children, or any other persons who shall be shipped to be transported to the Plantation, shall after their shipping miscarry, or die by the way : yet nevertheless, the person at whose charge any such miscarrying or dying person, Child or Servant, was shipped shall have and enjoy to him and his Heires for ever in the said Plantation, and to be set out and appointed as aforesaid, the quantity of thirty five Acres for or in respect of each one person so dying or miscarrying, in as ample manner, as if he had been safely transported, and come into the said Plantation. And that every other person or persons that shall adventure, after three yeares shall have five and twenty Acres. That whatsoever Ordinance can be recovered of any wraks, shall be wholly imployed for the use of the publick, and serve for the fortification of the Plantation. That all other wraks which shall be recovered upon, or near the Islands, or upon or near any the adjacent Islands : And also all Mynes of Gold, Silver, Copper, Brasse or Lead, Ambergreise, salt; and all rich woods, either for tincture or medicament, which shall be had or found upon or neer the Islands or territories aforesaid, in any Land not divided, or set over to any particular proprietor, shall be delivered into the Custody of two such persons, Merchants or Agents for the said Company as shall be yearly chosen by the said Company for that purpose, and the same Mines, Wracks, Ambergreise, Metalles, Salts and Woods, shall be by the said two Agents, made fit for sale, and be by them with all convenient speed, sold for the best price and advantage, and the whole price and value thereof (the Charges and wages for the procuring and fitting of them for sale, being first deducted and discharged) shall be divided into three equal parts and shares; and the first of the same three parts, shall be unto him or them, who shall be the undertaker or finder thereof : the second part shall be paid or distributed unto, and among the first Adventurers, their Heires, Executors and assignes, equally and the other third part shall be paid and delivered into the publick Treasury of the said Plantation, to be imployed and laid out for the use of the publick, by order and warrant from the Governor and Council there, for the time being. But if the same shall be found in any of the Lands appropriated, the first third part shall be to the owner or proprietor of the same Lands, and the other two thirds as aforesaid : That when the Plantation shall sufficiently be fortified, and all necessary works finished and the generall Magazines sufficiently stored, then what shall be spared of the publick third in works of mercy and charity, and for the transporting from England and other places such godly people as shall be willing to go unto the said Plantations, and are not able to beare the charge of their transportation and setling there. That no person shall pretend unto, or claim any Wracks, Mynes, Ambergreise, Salt, or rich woods, as aforesaid; for, or by reason of their growing, or being in or upon his lot or share of ground, which shall be appointed to him as above said; but all the said particulars shall be disposed and imployed , as before is expressed That none of the said rich Woods growing upon Land, not appropriated, shall be cut down by any person, but by warrant first had and obtained from the Governor and Councel for that purpose; and if any shall do other wise, then he that shall cut, or cause to be cut any of the said Woods without such warrant, shall loose and forfeit all that share which he might under any qualification whatsoever, pretend unto in the same Woods : and the same forfeiture shall be to the use of the said Colonie. That if any places shall appear fit for making salt, which yet makes it not naturally, then the salt-works shall be perfected at the publick charge, and the provenue thereof to come into the publick Treasury, and be imployed for ever for the publick service, as aforesaid. That no Inhabitant of these Plantations, shall in their converse with any of the Natives of any of those parts, offer them any wrong, violence, or incivilty whatsoever; but shall deal with them with all justice and sweetness, so far as may stand with their own safety, thereby to work in them a good opinion of love, unto the wayes and knowledge of God, which every one shall endeavour to hold forth, and communicate unto them in the best manner that they can. And whereas the Company is informed, that there are some Indians have been taken and sold at some of the Caribe Islands : It is therefore agreed and ordered, that the Indians shall be sought out and redeemed : and after they have some time continued in those Plantations, for their instructions, and make them sensible of the benefit. They shall be then returned to the places from which they were taken, that every Planter shall himself provide Arms and Ammunition sufficient, for his own persons (going to the said Plantations) and for his own persons (going to the said Plantations) and for every Male that he shall transport thither, who is or shall be from time to time able to bear Arms, and that such Adventurer shall not have his share of Land set out unto him for any Male person, unless he be as aforesaid, provided of sufficient Arms and Ammunition for them, That all in the said Plantation from the age of sixteen to sixty years, shall be ready to come to the several Randevous appointed them, upon any Alarm, ready and armed for the defence of the Plantations; That none shall be compelled to take Arms, or to go to war out of the Country unless it be for the necessary defence thereof, and to expel or divert an eminent invasion, neither shall any be suffered to take any depredations or invasions upon any either by Sea or Land, unless upon a War first begun by them and open War by the said Plantations, first denounced against them. That the Government of the said Islands and Plantations shall be continued in a Senate of the number of one hundred persons; and that the company of the first Adventurers aforesaid, shall at present be the same Senate. And whensoever any of them shall die or sell away his Interest in the said Plantations; then there shall be another elected in his roome from time to time, by the major part of the said Senate, out of the other Adventurers and Planters Resiant in the said Islands. And the same election shall be made in this manner, (viz.) First, 20 fit persons shall be nominated. Then those 20 reduced to the number of 4 by scrutiny and out of those 4, one to be chosen by Ballotines. And so from time to time, as often as any Member of the said Senate, shall decease or shall allien or discontinue his interest in the said Plantations, or shall be amoved by the said Senate, upon just cause or complaint. And that the same Senate from time to time, make election of all Officers, for doing of justice, and distribution and setting out of Lands, and for the care and over sight of all publick works, and shall have the ordering and disposing of all publick monies. That after the first three yeares expired, there shall be yearly a Governor and 12. Councellers chosen out of the said number of 100. Senators, who shall take the daily care of all things necessary for the prosperity of the Plantation and that it in nothing suffer detriment or decay. And that the publick peace be maintained between man and man, and speedy justice done unto every man that shall seek it at their hands. And that the said Governor and Councel, shall have power to call together upon any emergency, to the said Senate or so many of them, as shall then be upon the said Islands, and to act and execute what shall be by the said convention of Senators ordered and referred, or committed unto them. That the first Governor and Councel shall be elected by the first Adventurers in England, when the number of Adventurers, when the number of Adventurers who will transport themselves is once known. And that the same first Governor and Councel shall continue in their Office three whole yeares, from the first day of their arrival in the said Islands or Plantation. That all succeeding Governors and Councel shall after the afore-mentioned term expired, be yearly chosen on the first Tuesday in December, for one whole year to come, beginning the first day of January following, by all the free-men of the said Plantations, by way of scrutiny and Ballotines, in such manner as is before expressed. That every person that shall transport himself to the said Plantations, or desire to become a Member of the same Plantation, shall before his admittance thereunto, acknowledge his allowance, and consent unto all and every one of these Articles; and by subscribing the same, bind himself to conformity thereunto for the future, And this is to be done before he be admitted into the said company and before he hath any-share or proportion of Land set out and assigned to him according to these Articles. Curry, Robert Bahamian Lore. Paris: (Privately Printed), 1930, pp. 115 - 122.